June 12, 2018 — Aaron Barker ’11 lives on the same block as the Iowa Homeless Youth Center in downtown Des Moines, but he didn’t have an idea who the center assisted or what services were provided. That changed Saturday when Barker joined 10 other Grinnell College alumni for a morning of volunteering at the youth center during the 2018 Grinnell Global Day of Service. 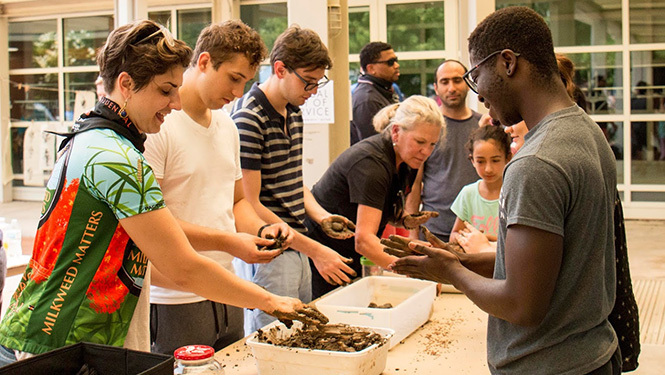 Grinnell’s Global Day of Service started in 2015 to honor Founders’ Day. On June 10, 1846, Trustee James J. Hill laid a single silver dollar — the seed that started Grinnell’s endowment — on the table at the first meeting of the College’s Board of Trustees. Grinnellians around the world have worked to better their communities ever since Hill’s contribution through giving and service. Des Moines was one of 11 cities where group projects took place Saturday and during the first two weeks of June. In Grinnell, participants made milkweed seedballs that will be dispersed by RAGBRAI – The Register’s Annual Great Bicycle Ride Across Iowa – riders to help support the monarch butterfly population. Other projects assisted food and community support organizations, or were dedicated to helping the environment. 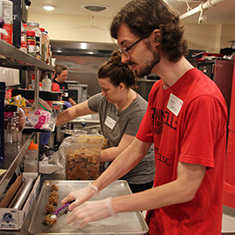 For alumni living outside group project areas, another option was independent service work. Over 250 Grinnellians pledged to complete more than 1,300 hours of service as a part of this year’s Global Day of Service. Alumni Council member Brigham Hoegh ’08 asked Naomi Ramsay ’14, Iowa Homeless Youth Center post-secondary education retention program coordinator, if the center would be interested in having volunteers for Global Day of Service. The Iowa Homeless Youth Center is dedicated to exclusively serving the needs of at-risk and homeless youth. Through case management and advocacy, center staff work with youth (ages 16-22) and young families (ages 6-25) to become self-sufficient, and plan for a healthy and successful future. The center has showers and laundry facilities, an art studio, computer lab, Netflix room, and emergency beds. Daily meals are served, and staff support and mental health counseling are available. During Global Day of Service, Grinnell volunteers cleaned the art studio, organized clothing donations, and did meals prep work at the youth center. Mark McAllister ’81 and his wife, Lori McAllister ’83, attempt to participate annually in Global Day of Service. The Johnston couple helped clean up the art studio Saturday. Ramsay said she wouldn’t be surprised if some of the participants Saturday went on to volunteer for the organization or shared the center’s story with other nonprofit groups they are part of. Ramsay appreciates that Global Day of Service has become an annual event the past four years. To share photos from your Global Day of Service project, send them to Anna Halpin-Healy ’13, assistant director of alumni relations for regional programs, at halpinhe2@grinnell.edu or post them on social media using #GCDayofService.